The Superocean Heritage II Chronographe diver's watch, is water resistant to 200 metres, and is styled with a stainless steel mesh bracelet and blue unidirectional ratcheted rotating bezel. Its blue dial features date aperture at 3 o'clock, 12-hour counter at 6 o'clock, seconds sub-dial at 9 o'clock, 30-minute counter at 12 o'clock. Automatic Swiss made calibre 13, 25 jewels, power reserve of 42 hours. 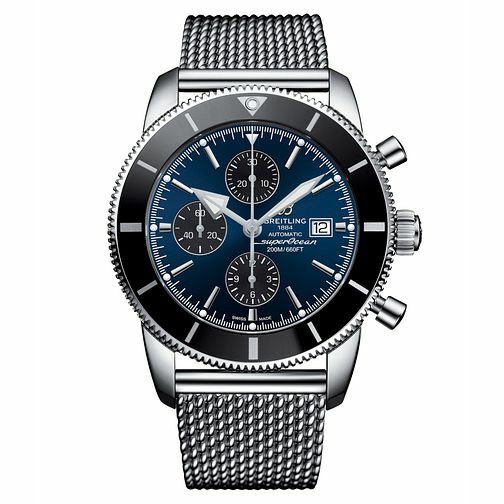 Breitling Superocean Heritage II Men's Stainless Steel Watch is rated 5.0 out of 5 by 1. Rated 5 out of 5 by Anonymous from I have 5 quality watches, and this one is my favourite, it for me has style, quality and looks whilst being practical, reliable and beautiful to look Honestly one of the best buys I have ever made, if you want a beautiful watch at a sensible price that will last you a lifetime this will do it. I have had mine for 4 years now and she never misses a beat, great watch great buy. Great to look at.